Deliverable D34.3 gives an overview of the results obtained by the Athens’ sewer mining (SM) pilot and additionally provides guidelines and recommendations for transferring the solution (i.e., SM) to other sites. Furthermore, it includes the valuation of ESS that result from the utilization of the SM solution. 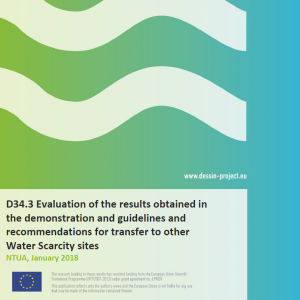 The deliverable is organized in two main sections, 1) Evaluation of the results obtained in the demonstration and 2) Guidelines and recommendations for transfer to other water scarcity sites.